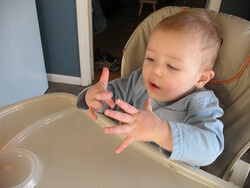 I don’t know what Carter was crossing his fingers for, but I hope he got his wish. Hello all. We are so sorry it has been a while since our last update. 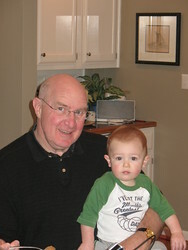 Since Carter's birthday, it has been a busy time for us and we have successfully made it through the holidays. We hope everyone had a wonderful and blessed Christmas and New Year as we did. To bring everyone up to speed, our Thanksgiving was short and quaint due to the weather messing up our plans with Grandma and Paw Paw Harris. It was predicted to snow and become dangerously icy the Saturday after Thanksgiving. This is when my parents and sister were supposed to come in and celebrate at our house in Abilene this year. We were all in agreement that they shouldn't risk the weather. 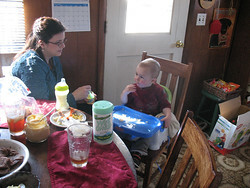 So, me, Will, and Carter had our first Thanksgiving together as a family with a yummy honey ham and some side dishes that really weren't so great. But we gave thanks and enjoyed a nice cozy day anyway. 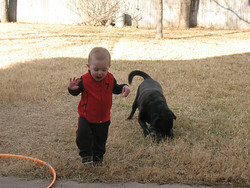 Just one week after Carter turned the big one year old, he mastered walking and he has taken off! He just chases Harley all around the house. We soon approached our long awaited vacation and road trip to Arkansas for Christmas to see Grammy and Boppa Wyatt, Aunt Katy and Uncle Chris, Cousins Jacob and Virginia, and Aunt Betsy. We had a wonderful week with our family with fun had by all. Carter and I had so much fun toddling all around a brand new environment. Yes, he was into everything! But, we only broke two things in their beautiful home. Sorry Grammy! Will didn't have the best time. He caught a gastrointestinal bug on the way there and was in bed for a solid 5 days of the first week. 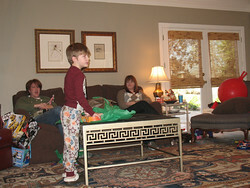 Christmas day was so much fun watching Carter run around the living room excited to tear open the packages. He loved playing with his cousins, and, oh yeah, Harley came too. He really loves interacting with other children. Thanks to Grammy and Boppa for a very blessed and memorable time that we will look forward to each following year. Right as Will was getting over his bug, it was time to come back. We decided to make the journey back to Abilene in one day as opposed to how we did it in two days on the way there. We left early that morning at 7 AM and arrived in Abilene at about 5:30 that night. Carter did exceptionally well (with constant entertainment by both me and Will). Needless to say we were all exhausted. Then three days later, last Thursday, I had my tooth implant that we had been planning for a long time. It went smoothly and I was surprised at how mild the pain is. Will was and still is the best husband in the world for taking such good care of me while I was drugged up for 2-3 days and for taking on Carter all by himself day and night. 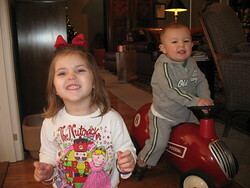 We ended our wonderful holiday with Christmas at Grandma, Paw Paw Harris and Aunt Tracy's house in Brownwood. Carter got a toy lawnmower from Grandma that will go perfect with the noise-reducing headphones Aunt Betsy gave him. Now he really looks like daddy! We all ended our holiday starting today. Will's back at work, Carter is running around in his new shoes, and Harley is back in his "quiet" place of the house. I will be starting back to work temporarily on Friday and Saturday nights at the hospital. It's not my first choice, but it's unfortunately where the money is. More comments on this plan will follow later when I try it on for size.